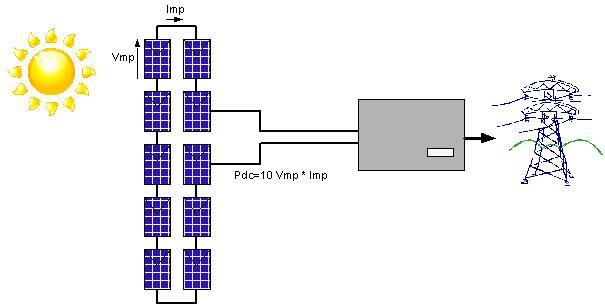 Principle: Today Photovoltaic systems are made with serial PV (PhotoVoltaic) modules to obtain a voltage in accordance with inverter input voltage. This inverter manages a global MPPT (Maximum Power Point Tracking). This principle is well when Photovoltaic modules are very similar and when sunlight is homogeneous on the entire Photovoltaic array. Unfortunately there are a lot of cases where a shadowing can impact a part of Photovoltaic array (tree, dust, chimneys, antenna, other buildings or specific relief). In this case, the shadowed module curve ( I-current versus V-voltage) moves as described in the following diagram. The current decreases a lot but not the voltage. Shadowed module has low current. To avoid impacting all the string, modules manufacturer adds bypass diodes inside the junction box and then shadowed module is bypassed. When module is partially shaded, the current don’t switch to the diode and energy yield can be impacted with production losses up to 30% under 10% Photovoltaic shading. The best solution to avoid these production losses is to have distributed MPP Tracking. That means one micro inverter per Photovoltaic module to track individual Maximum Power Point. Then micro inverter s can take the maximum power of each individual module without impacting the other module and the production is fully optimized always. There are few actors with two approaches of distributed micro inverter s.
Enphase Energy technology is based on a DC/AC micro converter and each converter is connected in parallel on a common AC bus. Petra Solar with SunWave AC Module. eIQ energy : bases on DC/DC micro converter with a independent voltage output and can be used with standard inveter. Solution Photovoltaic : a consortium of 8 research centres, universities and industrials with French government funds is working on it too. Both approaches fix the partial Photovoltaic shading issue. it’s easier and more safety to manage one grid connection point. All specific requirements for grid connection are very strong (VDE 126-1-1, RD1663, DK5940) and the multiplication of the deconnection devices increase the failure rate. there devices are subject to extreme temperature because of roof installation and this approach is minimizing the electronic parts and allow to increase the failure rate . Cancel module mismatch impact: Each module is independent and module ranking isn’t necessary. Higher price per Watt than a centralized converter. This solution costs 5% more than a centralized inverter (and conversion share is twice). Lower efficiency than a centralized inverter. We consider efficiency around 95 – 96 % for global converter versus 97 – 98 % with a centralized inverter. Also why using distributed solution? Higher price (+5%) and lower efficiency (-3%) are the opposite than the customer want: have the smallest ROI! But when Photovoltaic array is not installed in optimum situation as shadow not removable (chimney, lift machinery, air cooling systems …) the micro inverter technology balance higher price and lower efficiency regards improve energy harvest. This technology is very interesting when Photovoltaic systems are installed on urban roof where Photovoltaic shading constraints are not removable or where multi orientations are required by building architecture. It isn’t required for solar farm where Photovoltaic shading can be cancelled and modules orientation is optimized. Different market surveys consider than this disruptive solution will take between 2% to 10% of the solar market in the next 3 years. It will be a success story for disruptive innovation! or copy this trackback: http://engineering.electrical-equipment.org/energy-efficiency-solar/photovoltaic-micro-inverter.html/trackback from your own site. I found your website perfect for my needs. It contains wonderful and helpful posts. I have read most of them and it was informative for all. Your blog is excellent and very informative to our visitors. Post was very nicely written and it contains useful facts. I am happy to find your distinguished way of writing the post. •	Without bypass diode, you will limit the current for all the string and the yield harvest will divide by 10 or in the worst scenario, the cell becomes a receptor, heats up to a hot spot and destroys itself. In this case, you open the serial line and the PV production stop. •	With bypass diode, you will bypass the group where the cell is shading (i.e. 18 cells) and protect the rest of the string. You slash a small part of your string to preserve the rest of your yield harvest. It’s wrong to say the bypass diode improves the efficiency, but we can say that the bypass diode optimizes the possible yield harvest in case of partial shadow or fault on the string. 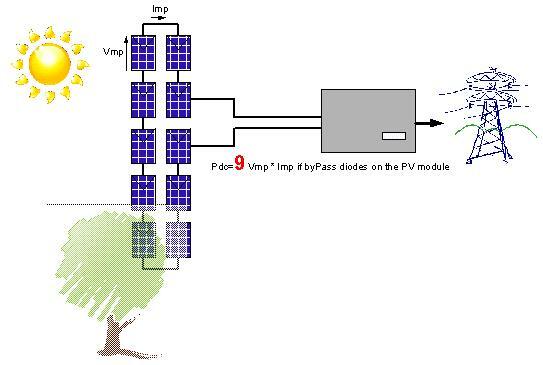 Anybody has a design guide for PV systems, from A to Z.
I would think that no well-designed PV system is designet with only one large inverter, as described here. Everyone whos involved in designing systems like this, know that one have to take account of shadows, by installing several smaller inverters. One inverter per module seem expensive. 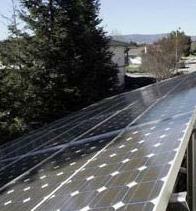 do you any contracting particular experience in installing that type of PV system ? or your comment refers to design know how? Can you help me set-up a small PV unit on my roof that can give me 650Watts or 150 VA power. what sort of help you exactly need? If I have an solar unit, how I shall get electricity with that, does it need more aparatus? Batery,circuit or any interter? Could you please help me to set up one unit? how about block diode in PV .mine is damage how to do that?please tell me that u know .thanks!